Placed onto a concrete base with a shingle trench around the outside for water drainage, this Blakeney Summerhouse with storage partition has been installed in our customer’s garden in Southmoor, Oxfordshire to use as both a summerhouse and shed. Multi-purpose buildings are easy to achieve with our range, as you can add partitions to most of our buildings to help get exactly what you want without having to fork out on multiple structures. 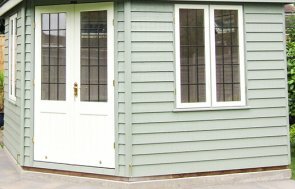 The Blakeney is a chalet-style summerhouse with fully glazed double doors, four sets of windows and a roof overhang. The customer chose grey slate composite tiles to go on the roof, which are a highly durable material that will protect against wind, rain, hail and fire. 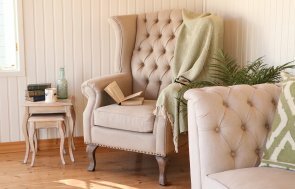 The colour of this summerhouse is Sage, which is a natural green colour from our Valtti colour range: Valtti is an opaque, multi-layered paint system that has a long re-decoration cycle and comes in a choice of 14 different colours. At 2.4 x 3.0m in total, this is broken down to a 2.4 x 1.2m storage section and a 2.4 x 1.8m summerhouse section. The storage door on the left-hand side of the summerhouse has got a security lock on it to keep their gardening tools and patio furniture safe inside. 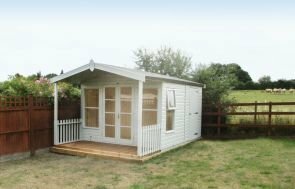 For more information on our range of summerhouses, you can come and see the buildings for yourself and witness their quality first-hand by coming to one of our Show Centres across the country. Alternatively, you can also Contact Us online, or call us on 01760 444229 to speak to our expert staff.